Progressive blackjack is a form of twenty-one with a side bet involving a progressive jackpot. Everyone knows blackjack has great odds for gamblers, but card players sometimes complain that blackjack is a grinding style of gambling, because the payouts are 1-to-1 or 3-to-2, at best. Progressive jackpots aren’t just limited to progressive slots games, though. The progressive jackpot has been adapted to most forms of casino gambling, after the designers of slot machines and video poker machines learned how popular they could be with the mass of gaming machine players. The idea of winning a lottery-sized jackpot is a major allure to many gamblers, because the windfall can change their economic situation in an instant. So it was only a matter of time before someone tried to combine blackjack with an accumulated pot. These days, many land-based casinos offer progressive blackjack. Almost all of the major online casinos offer the game, especially if you’re playing with one of the brand name casino software companies, such as Microgaming, IGT, Net Ent, CryptoLogic, or Playtech. If you’re an American real money gambler looking for the game online, your options are more limited. For instance, Realtime Gaming, which powers the most US-friendly websites, doesn’t offer progressive blackjack. If you want an accumulated jackpot combined with a card game at an RTG casino, you’ll need to play Let Em Ride (not “Let It Ride”), Caribbean Stud, Caribbean Holdem, or Caribbean Poker. Gaming networks like Rival Gaming, Merge Network, and TopGame Technology are competitors whose products you might continue to check out. The main bet in this game looks just like classic blackjack. Natural blackjacks pay at 3:2, while all other winning hands pay out at 1:1. You’ll find a variety of rules variations, but as an example, I’ll use the “Triple Seven Blackjack” rules used by Microgaming (“Triple-7” being their version of progressive 21). The rules used are the same as used in Microgaming’s multi-hand blackjack, which means it uses 5 decks and has 5 betting positions. Players are allowed to draw to split aces, but neither surrendering nor re-splitting is allowed. A player cannot double after splitting. Gamblers can double on a 9, 10, or 11 only. The full “no peek” rules are in effect, so you’ll lose your whole bet when a dealer blackjack occurs. The dealer stands when holding a soft 17, while insurance won’t be resolved until the end of the hand. Using these rules, the house edge on the main bet is 0.57%. 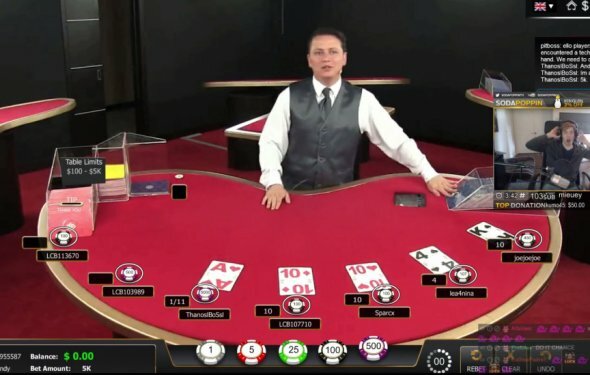 It goes without saying that the multi-hand option is not enabled in Progressive Blackjack, so you’ll only be able to play a single hand at a time. The only other variation in the rules is the stipulation that you must make a $1 wager on the side bet, which is what gives this game its unique character. All a blackjack bot is going to do is play basic strategy, and if you are lucky count the cards some. Pretty useless since online casinos shuffle after each hand. So no, you are not likely to win with it any more than if you simply put some effort into learning to play the game better. Poker bots are fairly pointless too, and if you are caught using one they will freeze your account and may take your money.